Master Han is a disciple of Grandmaster Yap Cheng Hai. He founded the Wu Ji Academy for the transmission of Taoist wisdom and its disciplines. Master Han has developped in strong and subtle experience in Feng Shui by making audits and consultations in more than 70 cities in Europe, USA and Indian Ocean. Born in Cambodia from a French mother and a Vietnamese father, Master Han (Nicolas Hardy-Nguyen) has lived in several countries, in Asia, Africa and Europe. Having always lived at the crossroad of cultures and religions, he developed a global and penetrating vision of the world, nature and human beings as a Taoist scholar. He inherited from his grandfather, healer and exorcist, a natural sensitivity to the invisible forces that he learned to understand and respect. As a link with his grandfather, he found in Taoism and more specifically in Feng Shui, the path of fulfillment. Following the steps of a Feng Shui Grandmaster for many years, Master Han has been involved in practicing and teaching Feng Shui in Europe, United States, Asia and Indian Ocean. As a Feng Shui Master he has benefited many companies, organizations and the private sector. Master Han is one of the few Feng Shui Masters to hold the "Water Dragon" secret techniques and to have access, through "Kan Yu", the mystical origin of Feng Shui, to the spiritual dimension of Taoist arts: "Qi". As a reward for his work in spearding Feng Shui in western countries, Master Han was appointed Ambassador for the Propaganda of the Feng Shui Culture in Europe, by the City of Langzhong, Sichuan, China. 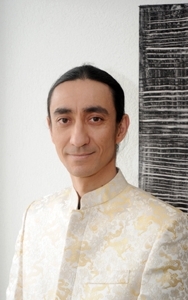 Master Han is based in Switzerland and is available to travel anywhere in the world to do Feng Shui audits or to conduct seminars and courses.